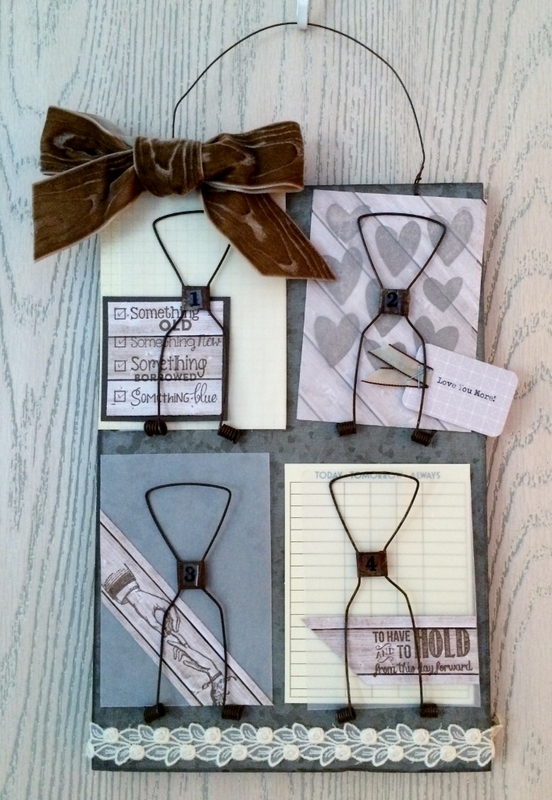 Just wanted to highlight a mixed media project, the fabulous Receipt Holder is so much fun to personalize for an event. I needed it for a wedding gift. 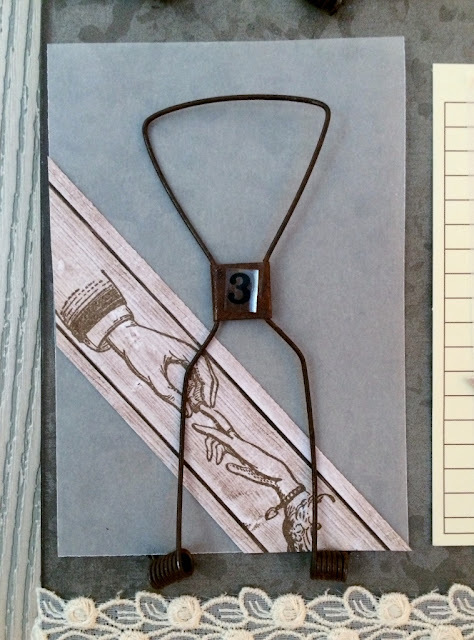 These new Hampton Art stamps added to the receipt holder were a match made in heaven. My idea was to add just enough embellishments to highlight 3 or 4 photos that they add later. So I started by stamping the four stamps shown onto Soup Staples III Kraft Triangles paper in brown ink. Then I added a vellum sheet to each clip. Under two clips I added mixed media ephemera mats with the stamped pieces added as shown. Keeping in mind that photos need to be added later I only used glue dots on the edges. Then I tied a bow in the velvet woodgrain ribbon and using string tied it to the hanger as shown. 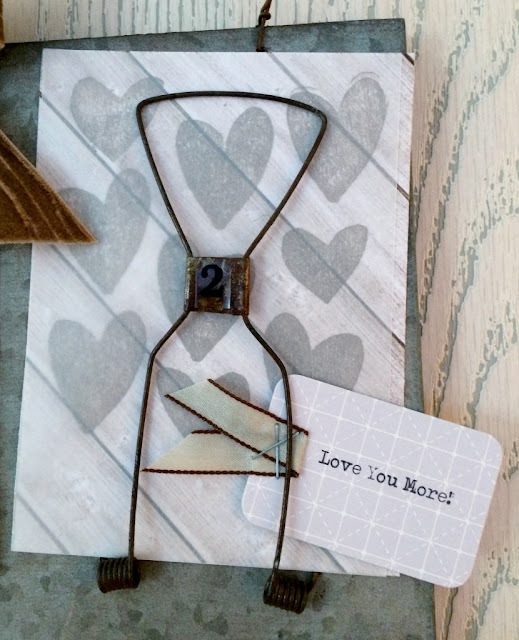 Then I added the notebook tag that says “Love you more” with a snippet of ribbon on the end. Last I added some lace trim at the bottom with glue dots. A quick and easy wedding gift, but it could be perfect for so many occasions. Graduations, Anniversaries, Birthdays, Vacations, give it a try. I would love to see what you come up with! Summer Red Raspberry Soup products from Jillibean Soup are on the menu for today (a very tasty line, I must say). Cut strips of patterned paper and cardstock, cut banner ends, layer, and adhere to 3.25" x 4.75" cardstock panel. Snip strips' ends flush with cardstock panel and adhere to card front. Use template to draw stitching with colored pencil. Adhere PeaPod sentiment with foam dimensional tape. Adhere wood veneer butterfly and gems. 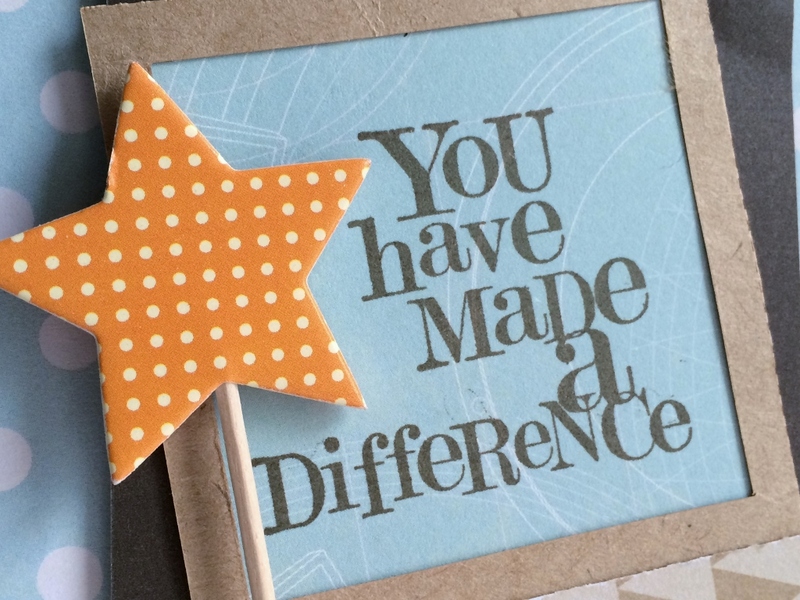 Once in a while we need to let someone know that they have made a difference in our lives. Hampton has the perfect new stamp for that occasion as you can see below. The card base I used was ivory then I layered on the Soup Staples III polka dot paper with a center panel of orange cardstock. Next I added texture by pulling out the sewing machine with white thread and sewing the center panel to the base as shown. After that I chose a mocha brown cardstock mat and a kraft frame from the placemat collection. Using a Soup Staples III paper, blueprint, I stamped in brown ink the sentiment. 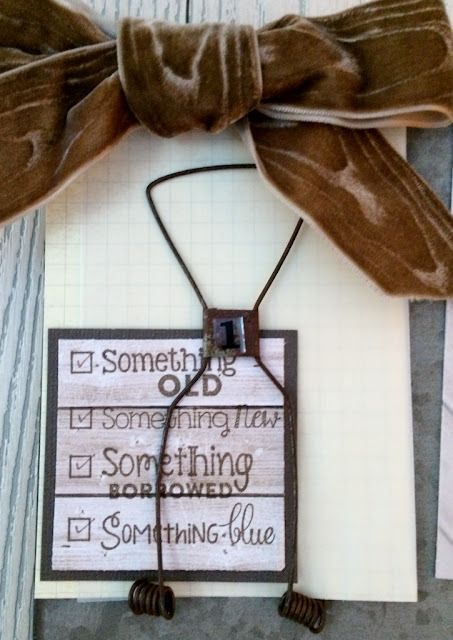 It was then layered under the kraft mini frame and attached to the mocha cardstock. Both were then attached to card base angled and adhered with 3D foam dots. It still needed something, so I added the kraft triangles border strip to the frame and the orange star embellishment is from the Party Playground collection. Just the right finishing touch I thought. 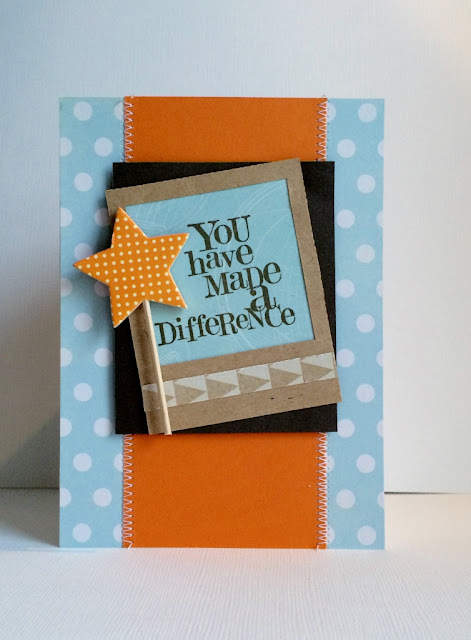 So now you have a special card for the difference maker in your life, they are all around us. They could be family members, teachers, pastors, Sunday school teachers, babysitters, coaches- so many potential candidates. Saying thank you and you made a difference can mean so much. Hello, Stampin' Addicts! Today's card features some products from Jillibean Soup's 2015 Saffron Yellow Pepper Soup collection. 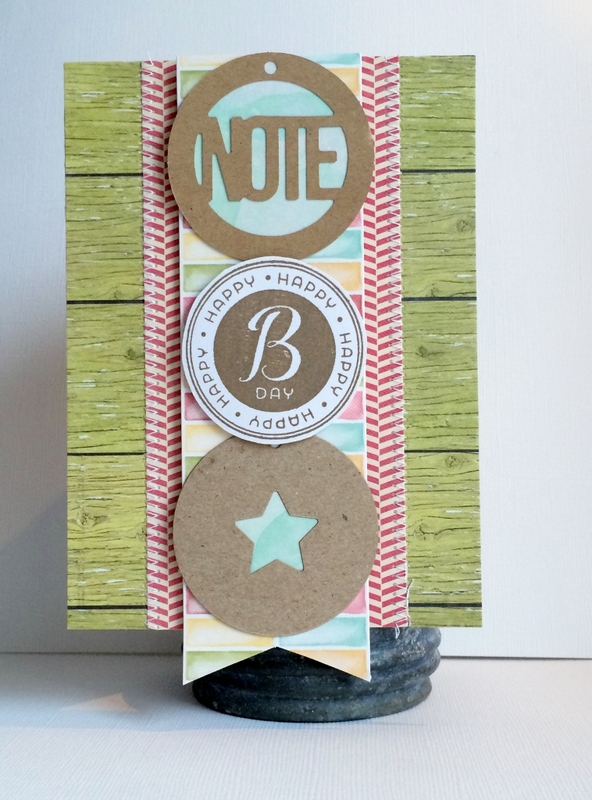 Make a 3.5” x 5” card base and round bottom corners. From two patterned papers, cut strips of cardstock .25" x 3.5" and adhere to card front, alternating patterns. 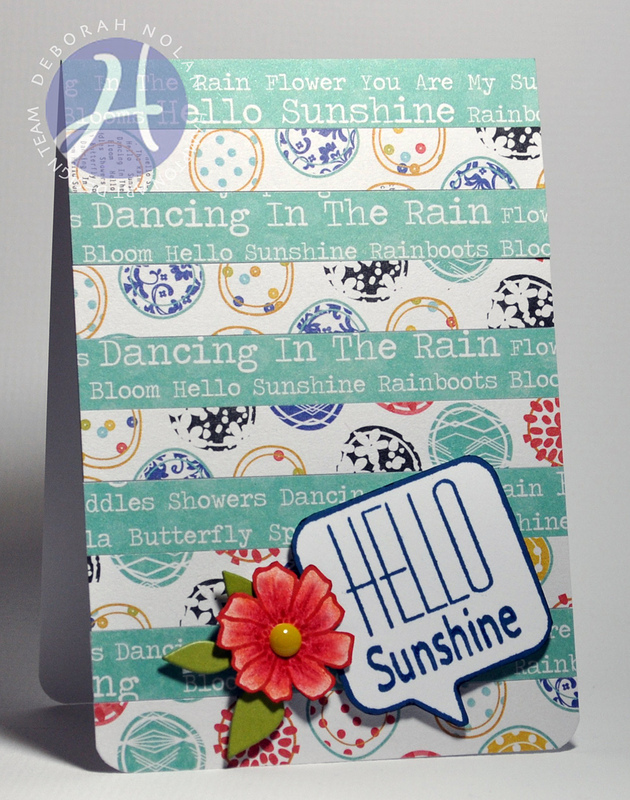 Fussy-cut stamp and flower, die cut leaf trio, layer and adhere all three with foam dimensional tape. I never seem to have enough Birthday cards in my stash, always reaching for another. Here is one that would work for all ages and gender featuring a brand new Hampton Art stamp set and three different Jillibean Soup collections. The first step was to choose a card base, I chose the green wood plank paper from the new Yellow Pepper Saffron Soup collection. Then I added a center panel strip from the Soup Staples III collection, attaching by sewing it to the base. Then I added the top layer multi-color strip from the new Summer Red Raspberry Soup collection with 3D foam dots. 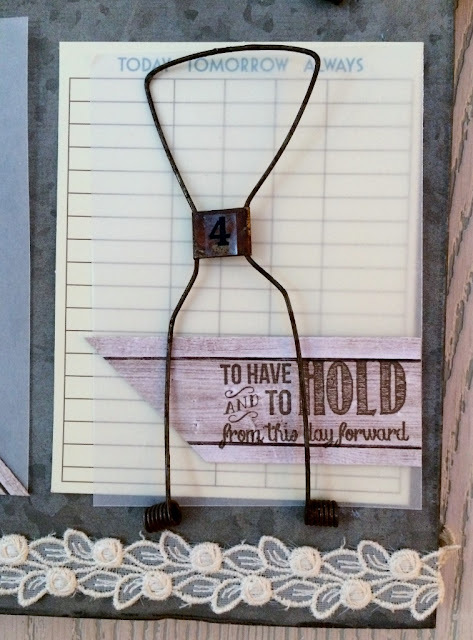 The middle sentiment was stamped in brown ink onto white cardstock and added with 3D foam dots to the center as shown. 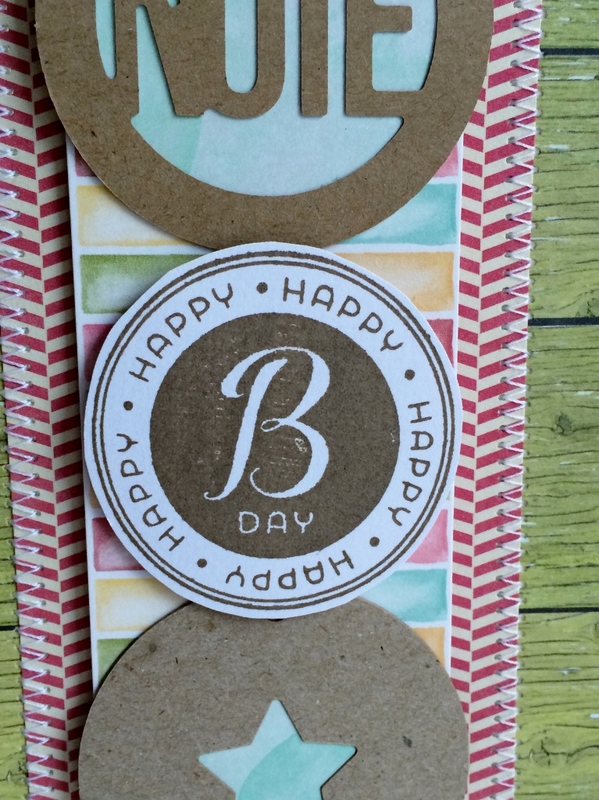 Then the kraft circle tags were added above and below after I layered some more Summer Red Raspberry paper under them. Another Birthday card is completed, cause for celebration. Check out this new Birthday theme set, you will not be disappointed.